NTT DOCOMO is preparing to push its LTE service to 150 Mbps maximum downlink rates, roughly double today's top performance. The 150 Mbps service is currently being verified in Kawasaki, Kanagawa Prefecture. 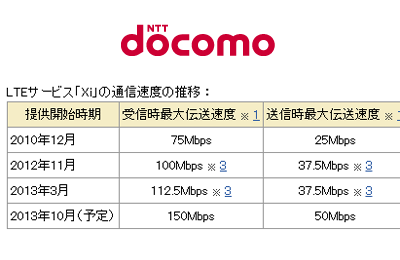 NTT DOCOMO expects to launch 150 Mbps commercial service this October, starting in parts of Tokyo, Osaka and Nagoya. DOCOMO, in addition to steadily improving the quality of its LTE network for increased reliability, continues to upgrade LTE coverage and data transmission speeds, most recently by expanding 112.5 Mbps downlink service to more than 130 cities as of this month. 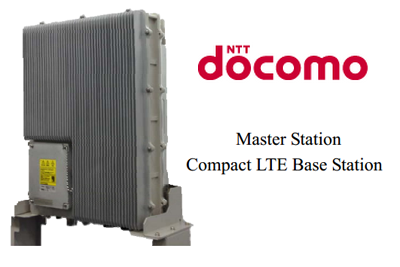 In June, NTT DOCOMO plans to increase its number of LTE base stations from 24,400 (March 31, 2013) to 50,000 by March 31, 2014. 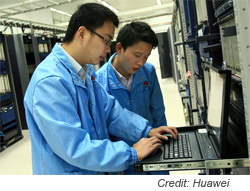 Huawei completed an end-to-end voice interoperability test for LTE TDD to CDMA. The test used the Qualcomm Snapdragon 400 (8X30) processor and its solutions for CSFB (Circuit Switched Fallback) and eCSFB (Enhanced CSFB). Huawei said CSFB and eCSFB voice solutions will play significant roles during the initial deployment of LTE networks. Kevin Wu, President for CDMA/LTE Wireless Networks at Huawei, said, "This successful test is a milestone for the commercialization of LTE voice technologies. It gives CDMA operators more choices for smoothly evolving to a wholly integrated LTE system, and reaffirms Huawei's commitment to protect existing investments and improving the operational efficiency of multi-mode and multi-frequency networks."